Leo - Japanese, about the quality of Ibanez, ie good, 1980- 88. Early 80's. Marketed by Fender (Leo Fender, get it? ), endorsed for a while by Doug Dillard. Leo was made by Moridaira in Matsumoto. Leo Deluxe was especially fancy in the inlay department. Lark In the Morning - I don't know what names they have put on these current instruments. Some appear to be Samicks, there is also one with an eagle head inlaid in marquetry into the maple resonator that seem more BC Cho like. Maestro - MaestroTone 250. - Korean from MusicYo.com in 2002 - 2003. Music Yo is a division of Gibson(!) The price and information on the MusicYo site were enticing; the price was $350-400 or so, did not include a case and shipping. After being out of stock since about April 2003, they are now again listed. Wayne Norman and I corresponded about this banjo a while back, and he sent an email to the sellers asking specific and informed questions about the details. They never answered him. So even though there is a 90 day money back policy shown, it does imply that if you buy one, there will be very little after the sale service, if they could not be bothered to reply to an inquiry before the sale. Maple w/ sunburst finish, H&F, rosewood fingerboard, one piece flange, brass tone ring, planetary pegs w/ geared 5th (Ping brand? ), clamshell tailpiece, white plastic inlays. The wood parts look similar to Korean Epiphone,, also a Gibson offering. If it is as described and reasonable quality, which is possible given what it costs to actually build a banjo over there, it could be a super deal. My guess that the current spate of banjos with brass tone rings (Morgan Monroe comes to mind, also one of the Gold Tones) is because someone has realized you can use spent ammunition casings to cast them, just like all the statuary and horns and such that are sold inexpensively by the roadside here. There is a lot of that brass lying around on the ground in Asia, and the kids are probably commissioned to bring it in to the village for collection. I would presume the steel parts of the primers are included in the mix, the powder residue will probably cook out. It is not going to be a controlled bell bronze foundry casting by any means. 1-16-03: Detailed pictures http://www.mit.bme.hu/~markus/banjo, courtesy of of Budapest, Hungary. One of the 2 instruments rated at banjohangout.org was poorly set up when received. Janos has had his apart, and wrote that it is an 8 or 9 ply light colored pot...likely beech but not mahogany as described on the seller's website. The wood under the tone ring is lightly finished, ie not to a gloss, so there will be good contact there. I'm still learning about the tone ring fit, it is loose, clear of the pot by up to 1.5 mm in some places. I don't know if this on purpose. Tone ring weight is 3# 7oz (1.560 kg). He closed his email with "BTW, I really enjoy playing it..."
Morgan Monroe - Korean, current, named for a state forest in Indiana. MNB-2 with tone ring is described at over 11 lbs., tube & flange construction, flamed maple resonator, nickel chromium plating with engraved arm rest, 24 brackets, eagle claw tailpiece, three piece laminated maple neck with rosewood fretboard and wreath derived inlay with the wreath on the headstock reversed, plus some other changes. MNB-1 (Rocky Top) has a rolled brass tone ring, probably like an RB-100. Headstock pattern is like the BMI/ BC Cho (Wave) banjos I have seen, though an eBay seller of these new said it was probably Samick. I suspect they all pass parts around anyway. December 2003: Caveat. There seem to be considerable quality control problems at this writing, and a significant number of instruments have arrived at dealers with flaws. While the distributor has a reputation of making good on these things, not all dealers will go to the hassle of getting things fixed. Examine the instrument carefully. Morgan Monroe in mid 2004 has introduced a much fancier series with very intricate inlay and such at very attractive pricing. I have not had a chance to examine one first hand. Wayne Norman (originator of this basic list) has purchased a Morgan Monroe archtop. Here is his assessment. Morgan-Monroe MRHB-1 Arch Top tone ring, Rocky Top BG Series. This and the Gold Tone AT-250 are, I believe, the only production arch tops currently available. Several other makers do offer an AT as an option. The custom made Stanleytone comes with arch top standard. Overall, the fit, finish and hardware quality is very high. I found no finish blemishes, no pits on the metal parts and excellent workmanship. Marked "Made in Korea." Design is very similar to a Gibson RB-5 Wreath, except that the sunburst finish goes from black to reddish yellow. Neck, resonator and block rim are maple. Peghead: reminiscent of the old Fairbanks/Vega Whyte Layde #2. Real pearl and abalone inlay. No inlay voids visible. Ebony fretboard. Inlays are not real pearl, rather some similar man-made material. It does not have the sparkle of real pearl. But it looks very good with extremely tight inlay work. There is no inlay at the 15th fret, (this is where the Gibson Mastertone block would have been). Fretwork and binding are first-rate. Hardware: planetary pegs which seem to be a bit better than the usual Asian pegs. Pot hardware is basically clone of Gibson, with a clamshell tailpiece and a two-leg arm rest, which, alone, is engraved (read: stamped-in design). Brass arch top tone ring has 40 holes. All metal is chrome plated, and very good quality. The tension hoop and one-piece flange are true old Gibson style: die-cast pot metal. Neck profile is standard Gibson. Two-way truss installed. Double co-rods that allow some up and down placement of the heel, due to over-sized holes in the rim. The action was ideal. The head was installed extremely tight and sounded horrible. So I went about to change the Remo top frosted head (I don't like them). The four resonator thumb screws were too tight for hand loosening, but have a convenient Phillips cut in the top. First, there were little lock washers under the tension nuts. I tighten strictly by feel, so this was a no-no, and I removed them. The resonator screws were misaligned and sticking because of the position of the resonator wall lugs. A little adjustment and that was fixed. But the screws had bad threads. Turns out that the tone ring was sitting above the top of the rim by about 1/64" all around, meaning that the bottom edge of the skirt was holding it up. Not suitable at all for good tone. The area of the rim where a tone ring rests should be raw unfinished. This rim had full stain and finish all over. So I put a sheet of sandpaper on the table saw and gently turned the rim and removed the finish down to the raw wood. Likewise, I removed the finish on the skirt area and removed stock so that the bottom of the ring rested firmly on the top of the wood rim. There was excessive side play between the skirt and rim, so I glued in a strip of 1mm Finnish birch veneer and that made a nice slightly snug fit. I re-assembled the pot and installed a Sullivan FQ head (Ludwig). My usual practice is to set the head up very tight and leave it for about a week to stretch out. Then I loosen it down to a dull thud and gradually come back up to a good tone. At a certain tension the tone popped in and it came alive. I mean alive. This banjo now has everything tone-wise. Move over Stanleytone. The clamshell tailpiece cover did not snap all the way closed, so I got in touch with the dealer, who gave the name and number of customer service at Morgan-Monroe. I told her about the resonator screws and tailpiece. I had new parts two days later. This turned out to be an outstanding banjo, both tone and esthetics. But if I did not have the capability to correct those rim problems, it would not have been so. I love it and it has a good feel to it (a good banjo is like a good woman). Morris - Japanese - Peg head is traditional Gibson style, "Morris" inlaid at slight angle between second and third tuners, bell shaped truss rod cover with "Standard" etched in it, head inlays are a gold colored, possibly from lacquer aging. Quite good planetary tuners with pearloid buttons, geared fifth. Nickel plate. Nice but simple mother of pearl inlays at 1,3,5,7,10,12,15,17,19 and 22 with bow tie type from 10 onward. Bound rosewood fingerboard with small fret wire, clamshell tail piece with Morris inscribed. 2 foot pressed arm rest and flat head tone ring. Gibson style one piece flange, probably zinc, also Gibson style flange brackets, 4 resonator screws. 14" resonator on the banjo examined is probably non original (Korean). Nashville - Gibson copy, mid 70's (one bought new in '78) ebony board, multi ply rim, 2 piece flange flathead. Orpheum - like an early 70's Ventura or Alvarez, but with the early 70's Tokai (Japan) Blue Bell pot with the Mastertone style tone ring balanced on a round brass ring, up inside the flathead ring, sitting on top of a wooden mound also inside of the ring. Very bright sound, nice banjo. Definitely not a W. F. Lange (Paramount USA, 1920-35) product. Ozark BJ600 - Seen on an English vendor's site, Korean, maple, wreath inlay, 3.5 lbs claimed for the tone ring which indicates it is probably (shell case?) brass, chrome (? ), 14" reso, eagle claw tailpiece, stamped engraving on armrest. Pedro Martinez - Japanese, available (at least) in Italy in the early 80's, manufactured by Iida. 2 -3 quality models, see below. RB 115 - the most widespread sold model including the entry level ones, neck wood is Lauan mahogany, polyurethane-sealed without any final transparent top coat on the walnut-stained polyurethane finish (as on many Japanese instruments of that period, playing wear would show the sealer). Fiddle-shaped headstock cut perpendicular to itself, not to the neck plane, with an "abalonoid" fleur-de-lis inlaid in black face, unbound peghead. Plywood fingerboard (!) with thin ebony overlay less than 2 mm thick and white binding. Slotted diamond, real pearl inlays, functional truss rod. 6-ply (standard 11' dia., 3/4" thick) rim with Lauan mahogany outer wrap to match the neck and resonator (weird). Single turnbuckle-type coordinator rod, with anchored lag bolt (quickly prone to strip, because the anchoring bolt is a wimpy wood screw). Close-to-Mastertone specs aluminum flathead tone ring, 24 brackets, shoes-and-flange, Gibson-style flange holes, half-thickness notched tension hoop, Waverly tailpiece, standard type Luan mahogany resonator (3-lug like 60's Gibsons) with white binding on top and bottom (no purfling rings on back), all hardware chrome plated, very good quality stock bridge, thin-frost no-name head, offset gear 3:1 pegs, mounted from the rear with peghead bushings, friction 5th. Comments from the owner, a luthier/ musician in Milano, Italia: "The instrument was good-sounding from the start, although with the well known echoey 'aluminum wolf-tone', and all one would ever ask for could be a bit more 'body' and authentic 'ring', because playability was superb, tone production was ready and responsive, and with a meticulous setup it was credible as a banjo can be." RB 110 - identical but for the maple construction with honey-gold finish (plus two strap mounting rings bolted to the rim) and limited availability. A rare unidentified model with black plastic rim, (Wow!) pot metal tone ring, tube & plate flange, hexagon abalonoid inlays, geared 5th peg and a 4-lug resonator. To clarify, the pot is like a conventional Gibson one, but rather than being maple or birch is a solid plastic part, possibly Bakelite or ebonite (a time honored woodwind instrument material), with a steel or pot metal Mastertone style tone ring on top and a tube and plate. There is a photo of this banjo at the site of the Italian string band Beans Bacon and Gravy. This is a very big picture and a long download and you can't really see the details of the plastic; looks like the black of an RB250 rim. I don't quite know where to classify this one, I'll put it here because of the tone ring and tube and plate. Quality of the plastic and sound produced is unspecified by my source so far. Penco - Japanese Masterclone, late 70's (?) Seen at a fest in the southern tier of New York, I believe the name stands for Pennsylvania Company. There were guitars too. Saga - Saga brought in nice banjos under their own name about 1979/ 80. Top quality parts on Bella Voce and Style I except for the pot, which seems to be the weakest link. It seems to be the German made multi ply one and the tone ring fit on mine is not the best. The multi ply rims are not necessarily bad per se, I've had good and bad ones. For that matter, I've encountered dud 3 ply rims... I expect to build a prewar clone featherweight 4 ply rock maple pot with a dowelled and ledged lip for my Bella Voce and to fit a 70's NOS 4.4# Iida archtop ring (also over-height and chrome!) and a brass (chromed) Bucks County tension hoop to it. I have very high expectations for this setup, tone-wise... it likely will have some volume too... I love a great archtop. Saga Banjos were not a stencil brand, identical to other contemporary brands such as Ibanez or Fender except for the inlay pattern. The Sagas were made in a small contracted shop that only produced Saga Banjos, and probably the few high end Brazos. Bella Voce inlay banjos in striped mahogany, over-height lightweight 2.25# bell brass flathead tone ring (NOT interchangeable with any form of Gibson spec ring), multiply pot, 2 piece steel flange, offered in parallel with the Gold Star flatheads, a thin (resonant) Paramount like resonator, wbw binding and concentric rings on resonator, Gotoh planetary tuners, brass eagle claw tailpiece, chrome, slightly arched fingerboard on a fairly full neck, pot metal tension hoop. The "Special Florentine" model has been seen in a December 2007 eBay sale. Apparently the same as the Bella Voce except for the inlay pattern. 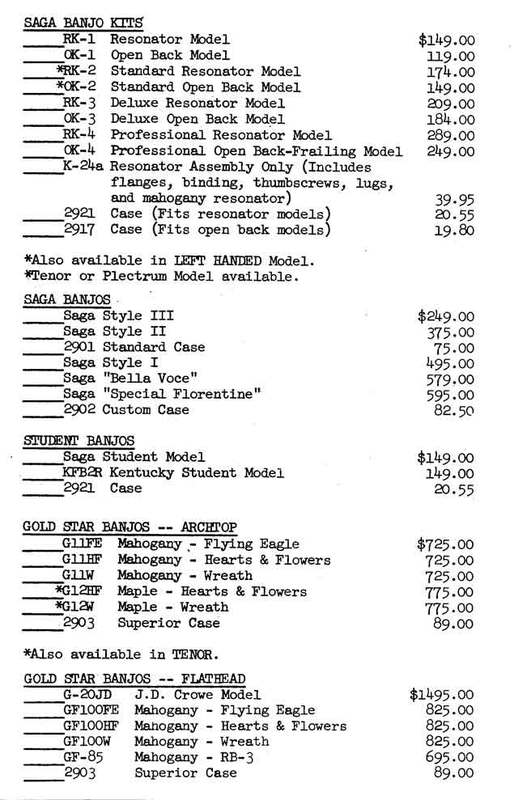 See the Saga price list from 1979, in which the Special Florentine listed for $16 more than the Bella Voce. Style I - same as BV except for 70's style RB-250 inlay. A long time player and former Gold Star agent describes his as having a sweet tone, still with highs. Style II - Die cast tone ring, mahogany, bow tie inlays, more modest tuners. They also had parts for sale at attractive prices. For example, there were various necks which were available unfinished. 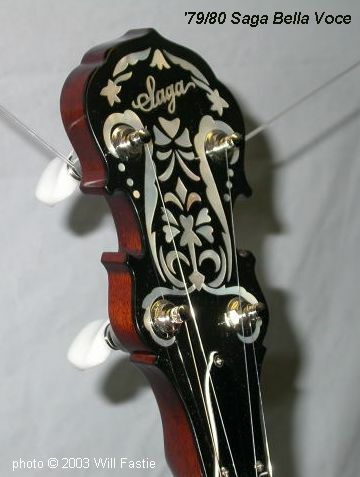 Saga is a BIG player in the musical instrument game, supplies very nice guitars under the Blueridge name, and mandolins under the Kentucky name. They imported the first Chinese made fiddles/violins to the USA, now a common thing. They also have a very attractive SKB like molded case for banjos, and at the moment have left handed ones..... this is likely a production error, so get them while you can. See also info under Gold Star. Samick - One of the major Korean builders, will put any name on, etc. Actually the source of Epiphone, Washburn, Aria, and many more. Daewoo is the other major Korean parts supplier. Sho-Bud - Model RB250, from the Nashville steel guitar house of Shot Jackson, this was a 70's model RB250 copy with slightly different inlay on the 12th and two inlays missing at the base of the fingerboard, the last ornate one and the Mastertone block and with the addition of 2 earlier RB250 style concentric rings in the resonator. From the pictures sent me by a original (March 76) and very satisfied owner it appears to be similar to an Ibanez: tube and plate, two coordinator rods, 11 ply rim (like then current Gibsons) planetary tuners and an eagle claw tailpiece, and the finish and chrome plating (not nickel) is still superb after 25 years. The condition of the chrome is a pretty good argument in favor of chrome instead of nickel, echoing the sentiments of Greg Deering of Deering Banjos. Chrome is less susceptible to oxidation, tarnish, etc. The traditional use of nickel is probably due to it being less expensive than chrome, chrome is an extra layer on top of nickel plating. The case is the usual Japanese one of the period with the bumper rail around it, on this one the covering is black faux leather instead of the usual brown: the interior is still the expected bright yellow plush. The banjo is heavier than a Gibson of the period, which implies to me a bronze tone ring. The owner has not had it apart since 1976 (!). I bought a '74 RB250 new and the bronze ring in it was light, at 2 lb. 8 oz. 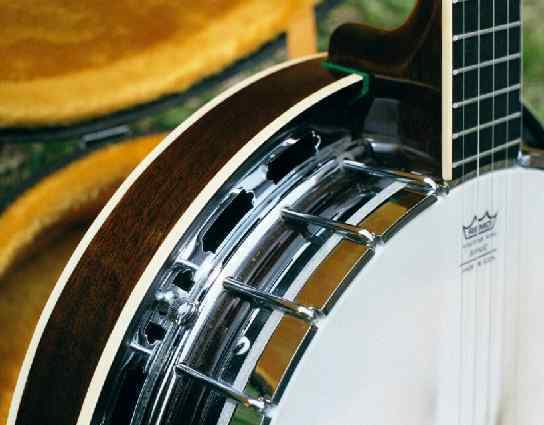 If there was typical die cast pot metal ring in the Sho-Bud, that ring (and the banjo) would be even lighter, typically at 1 lb. 12 oz. The guys at Sho-Bud knew how to build instruments and could have bought good tone rings in the USA like the Liberty or the Ryan to be put into the instruments, just like you can get JLS rings in Gold Tone today. If someone knows the origin of the tone ring or has any other info on this banjo, please contact the owner, Jeff Kirby at . Because this is a particularly clean example of a rare brand, and demonstrates the very high quality available in a Japanese banjo, I include a close up *.jpg of the Sho-Bud pot assembly and the banjo in the case. Also seen on eBay in an earlier version, in the transition when the Japanese were still learning it had to look just like Gibson to sell. This one had the earlier block tuners and a cast flange with ovaloid holes like early Alvarez. Tone ring quality unknown. Sonata - Seen gold plated, dark-stained flamed maple, clear head, clamshell tailpiece and carved heel and back of peghead, similar to Korean Washburn B-17.. The inlay design on the peghead is almost identical to that on the Washburn B-17. This one was circa 1995. Taka - Model G-180, early 70's RB250 copy. Tokai - (revised) Many different banjos, Tokai built the early Gold Stars through '81, but also build a wide range of instruments including many of lesser quality. In other words, if it is a Tokai it may be of Gold Star quality and construction.....and IT MAY NOT BE HIGH QUALITY or even have a Mastertone style tone ring. They had a similar serial number system and labeling to Saga/ Gold Star. The Gold Stars had all the best choice of parts, this is not always true with the Tokai's for the home market. The fine GF100's were the Tokai T1200R in the home market. Caveat emptor. Tyler Mountain - Current, Korean. TM5-80. Two piece flange, yellow to red to black sunburst reso, chrome, flathead, mahogany (? ), Reno-ish peghead inlays, blocky (boring) ones on fingerboard. Univox - Japanese, 1971-72 at least. This is from the company that makes Guitar amps, etc., under the same name. Similar to Alvarez, Ventura with the same peghead shape, blocky cast housing tuners, ovaloid shape holes in the flange, bow tie inlay, Waverly style tailpiece, but a different pearl pattern on the rim of the resonator. There is also the possibility of a Deluxe model, with ornate neck and resonator, but the one seen may have been an upgraded instrument. Also seen with a flange with Gibson shape holes, and stamped/ engraved armrest: this one is would likely be a few years later. Vega - (Japanese?) I have seen one recently that looks to be made about mid 80's. Shoes bolted through a wood pot with a faux White Layde band under them, Tubaphone tone ring. Orange reddish mahogany, white trim, three piece neck, dots on the fingerboard, small Fairbanks type headstock, Vega in pearl, thin sidewall bookmatched resonator, 70's (not 1920's style) Waverly tailpiece, Saga planetary tuners with large pearloid buttons. Fairly bright tone, but I did not get to thoroughly set it up. It seems to be an unknown chapter in the long history of the Vega name. Looks to be built later than the ones below, not quite as high quality hardware and wood. Vega - (Korean?) The company that bought the name from Martin was Korean, but the banjos were probably built in Japan. A very few, post Martin, pre Deering, when the name was bought out from under Greg Deering in about the late 70's. I saw one about 1980; nice banjos, reddish mahogany, pie (8?) section resonator, white binding with thin black and white on the edge. It was a clear head, and may have had a Tubaplone tone ring. I don't think it was Mastertone style ring. From the same period, a fancy vine/ tree of life inlay in the ebony fingerboard and peghead, model VV24, s/n 2016 with MOP decorated segmented resonator, Mastertone style ring, clear Remo head, Vega on the peghead. It is a high quality instrument, described as a "visual knockout." More recent ('90's ?) are Korean Vegas which are Gibson style 2 piece flange and zinc FH tone ring just like the Epiphone MB250 with Vega inlays and peghead shape. There is a model with carved heel (like Washburn?) and a knockoff of the wreath inlay also, garish sunburst (black to red to yellowish), 2 pc flange, chrome, 2 rings on the resonator. Ventura - see Alvarez 4282 above. Washburn (Korean) - B16, current, seems to be similar to Samick. Reno inlay, eagle claw tailpiece, chrome (? ), flamed maple. B17, current, has a 5 piece carved neck, Samick headstock shape, complex and unique inlay, eagle claw tailpiece, carved, flamed maple gold plated instrument. B-19 is a 3 piece maple neck with a dark center strip, stained very dark brown, heavily carved heel and back of the peghead, simplified wreath inlay pattern with Samick shape headstock. Neck (only) seen on eBay, cut for 2 piece flange. Wave - Current Korean banjos, combination products, from B. C. Cho Inc. somewhere in Korea. I set one up for them in their booth at NAMM LA 2000. They took lots of notes, lots of chattering in Korean.. Fun time for all..
Wilson - like early 70's Alvarez No. 4282, made for another distributor. Mahogany, marquetry on edge of rosewood veneer resonator, filigree diamond pearl inlay on back, bow tie, block tuners, chunky early head shape.